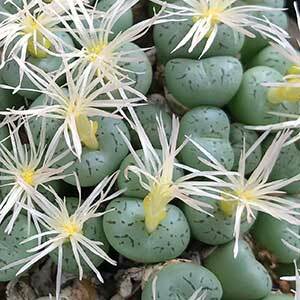 A miniature succulent, Conophytum are grown for the form, the flowers and interesting patterns. 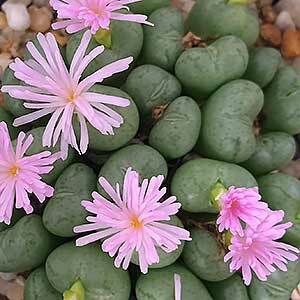 They come in a range of forms, flower in the autumn months and interestingly they flower at different times of the day, some are night flowering, such as Conophytum klinghardtense. They are from areas of dry summers and wet winters, so this seasonal rhythm dictates care. These are an easy care plant and are mostly grown in containers. They do like good light, however will need protection from the hot afternoon sun to protect the laves from burning. After they flower they should be mist sprayed until active new growth commences in spring. In hot summers, the plants will go into dormancy, so hold back on water during this period. If the leaves show signs of dehydration, wrinkling ornamental shrinking then they need to be watered. Potting mix or growing medium needs to be open and free draining. Fertiliser is generally not required, if you repot these little succulents each year, and you should, the new potting mix will contain enough nutrients. A little fertiliser just before flowering can be beneficial if you have neglected the plants. Keep Conophytums frost free and out of the extremes of the heat of summer and you should have few problems. Propagation is from seed and by division.